Want to be more confident? Confidence can make you more successful in business, social, and educational environments. It's also VERY important to help you practice your English. If you know me, you know that I am a confident person -- I'm going to give you my top tips to help you feel comfortable and confident. Whether you are speaking English at a meeting, party, or just your daily life, you'll learn about the bad things you MUST stop doing, and about the best things you can start doing today to start feeling more confident. Take the quiz! 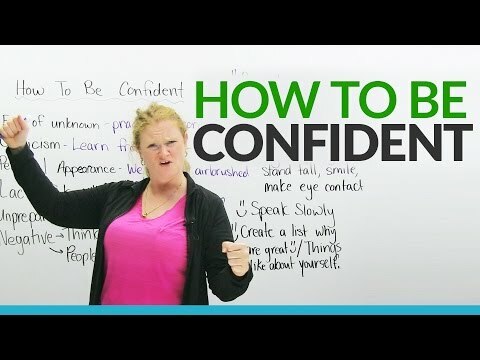 https://www.engvid.com/how-to-be-confident/ TRANSCRIPT Hello. My name's Ronnie. I'm very confident, and I really like talking. [Sighs] Oh, god. [Laughs] Do you think that one of the reasons why you don't like to speak English is because you lack confidence maybe in speaking or in writing, or just in your daily life? Confidence is the number one problem that you have while learning English. So, a lot of people talk to me and say: "Ronnie, I can't speak English. I'm terrible." And I say: "Oh, no. You can speak English. You are not terrible." So, I want to help you and I want you to become more confident in your daily life, whatever you do, not only English, for everything. So, I'm going to teach you some tricks or some methods to become more confident. Thumbs up. Even if you're not, then just pretend. Everyone pretends. So, I'm going to go through things that are bad and the reasons why you and I are not confident people. First of all, we have a fear. We have a fear of the unknown. We have fear that we don't know what's going to happen. Maybe you're going to go for a job interview, or you're starting a new class, or you're going to go on a date, or you're meeting new people, you're going to a party - we have no idea what's going to happen. That's cool, let it happen. We can't change the future. We don't know about the future, so what we can do is we can prepare our self. Now, if we're talking about doing something, like a presentation or standing up in front of people, going to a party, especially if you're trying to speak English, what you can do if you're worried about your English is you can practice speaking at home. Now, this might sound a little crazy, but who cares? What you can do is take your phone, you can record yourself speaking English. Maybe you're doing a presentation, so record your presentation, listen to it. [Gasps] You think it's terrible? Do it again. We have an expression: "Practice makes perfect." It's not going to be perfect, but it'll be good. So the more you practice something, the more comfortable you're going to feel, the more confidence you're going to have, and you're going to rock that. You're going to go to the party and be like: "Yeah! I'm the best party person ever." Or you're going to go to your job interview and you're going to get the job. I feel like I'm an infomercial. Okay, the next one and probably one of the hardest is criticism. Criticism means people tell you what you do wrong. People tell you bad things about you. People tell you your pronunciation is terrible, your work is awful. How do you feel? You feel: "Oh my god. Why am I even alive?" So people criticize you, and depending on how they do it... For example, if you have a boss who only tells you bad things, this is not a very good boss. But if you have a boss who criticizes you and tells you positive things, this is getting better. But what we have to do is we have to learn from the criticism. We have an expression: "Don't take it personally." This means, for example, if your boss says: "You know what? Your... Your presentation wasn't that good." Instead of: "Oh my god", instead of feeling negative or feeling bad, just go: "Okay. Well, please tell me how I can make it better." Your boss is there maybe to help you, unless you have a terrible boss, but always try and learn from the criticism. If you've done something wrong, admit it and go: "Oh, do you know what? You know... You know, that was terrible, but I can do next time better." So always try to improve from your criticism. Critics are maybe your best friends because they tell you what's wrong and you have to listen to that. Next one. I'd like to inform everyone out there that you are not airbrushed models, and I am sure far from being a model. What happens is in magazines nowadays, we have these beautiful ladies. They are simply perfect. Look at her lips, and her nose, and her eyes... Actually, she doesn't have a nose. This woman has no nose. Where's your nose? I have eyebrows, by the way. She does not have a nose. So, if you... Oh my god, Angelina Jolie, she's gorgeous. Her life's a mess, but she's gorgeous. This is airbrushed. This is not real. These are not real p-... Oh, hello. I'll just be over here, okay. These are not real people. These are processed, Photoshopped just images of bodies. Изучение английского языка будет простым с видео How to be CONFIDENT!.